It’s beginning to look a lot like Christmas and it’s time to decorate my entry way. This would work great on a porch too, but we don’t use our front door in the winter because for some reason the vinyl planks are extremely slippery. I have fell many times shoveling the porch, one minute you are standing, the next you are not. 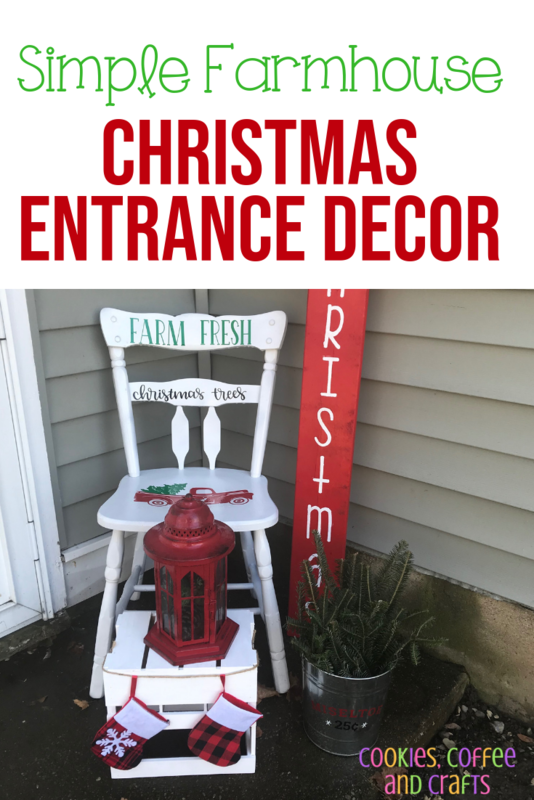 Here is my Simple Farmhouse Christmas Entrance Decor, which looks perfect with my Buffalo Check Pine Berry Wreath . The decor post has had me a little nervous because I’m more of a crafter/creator then a designer. I can make beautiful things, but making it all come together sometimes is tough for me. I’ll also admit I’m super picky when looking for decor items, which might be an issue too. 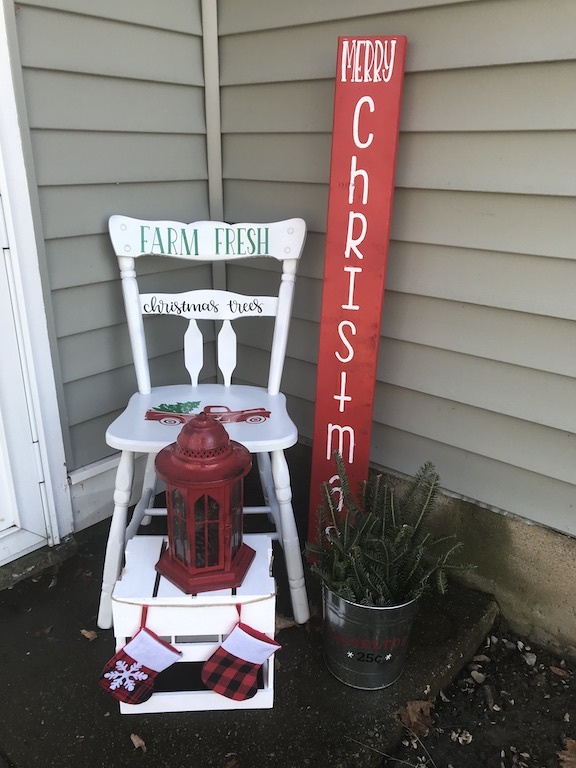 My kids love their Christmas inflatables and candy cane striped bows in the front of the house, but I wanted a corner of the house that was more my decor style. The weather decided to finally cooperate because it has been raining for days and I have been out decorating in it. I thought for sure I would be doing photos in the rain which would not show how cute this entryway decor is. I wish it would snow instead because the rain just makes mud everywhere and makes everything look dirty. 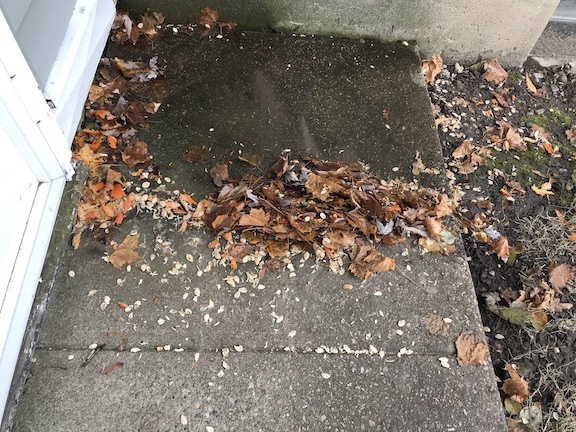 Before I could start decorating for Christmas though, I had to clean up the mess the squirrels made with the pumpkins by our entryway. They ate through all of the little pumpkins and left this mess. 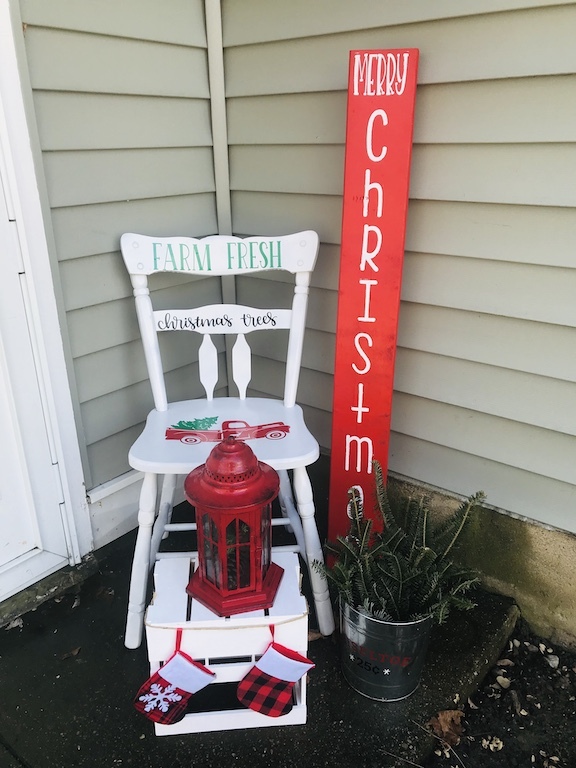 I wanted to create a simple farmhouse Christmas entryway inspired by my Halloween Chair. 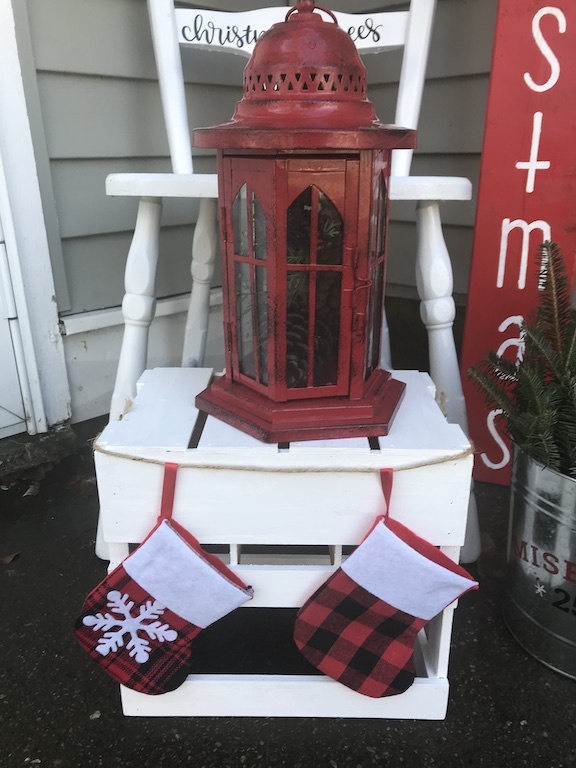 I know you’re probably thinking this doesn’t make sense, well I fell in love with my Halloween Chair which inspired me to create a Christmas chair for my entrance decor. I love real farm fresh Christmas trees and we all know how cute the little red truck is. It made the perfect Christmas chair. 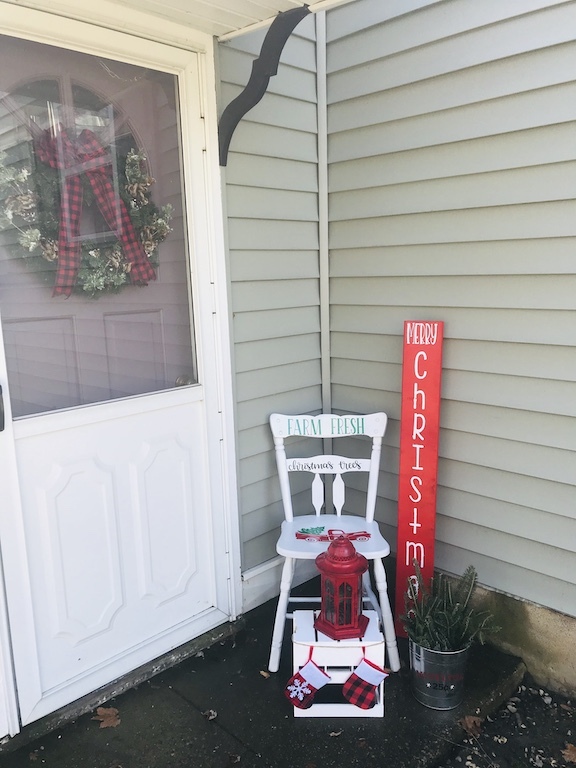 The little red truck Christmas chair is so cute and perfect for the corner of the entryway. To add some height to the decor I created a Merry Christmas porch sign using svgs from Lovesvg. I love how lanterns look in entryway and porch decor for all seasons. So I added pinecones inside because it’s a simple touch that adds more of that farmhouse country style. The cute pinecones with buffalo check ribbon are from the Dollar General, I was surprised by all the Buffalo Check they had. The little stockings on the garland are also from the Dollar General too. 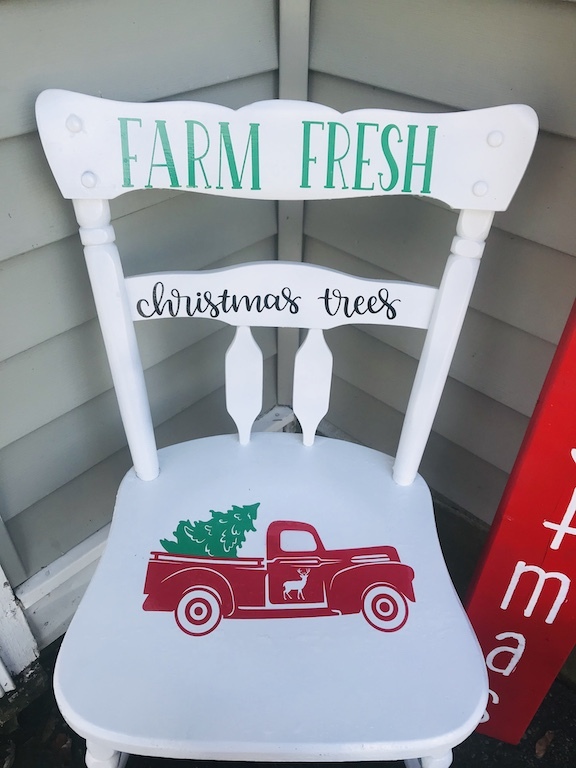 Fresh greenery was needed to go with the farm fresh trees chair in the cute bucket from Target. 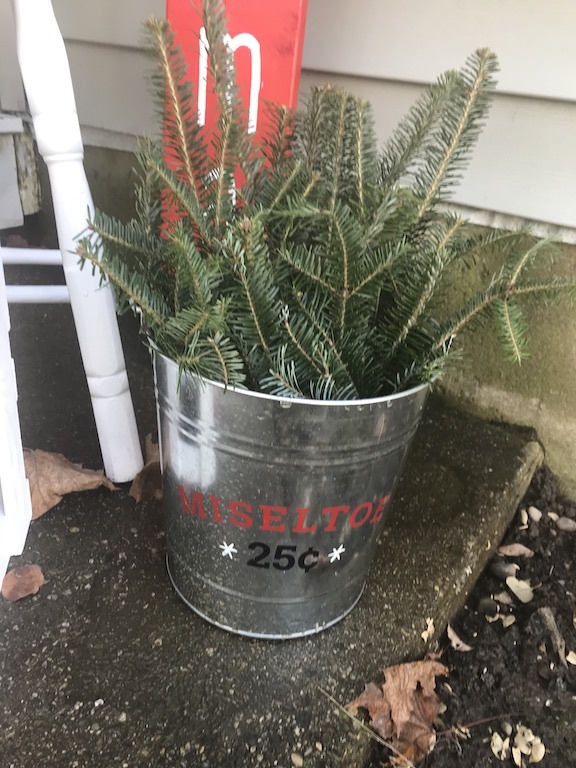 When we went to pick out our Christmas tree, the nursery had fresh greenery available to purchase. It smells amazing and was perfect to fill the bucket. My mind is thinking of ideas of how to use the leftover greenery. 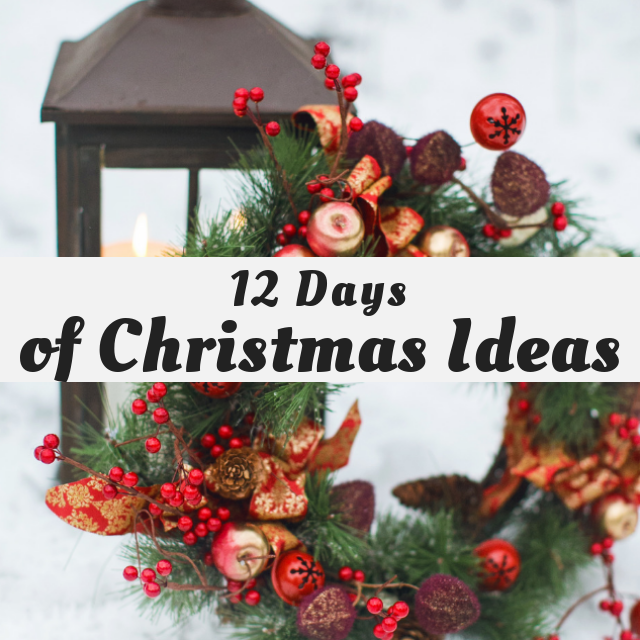 Simple touches put together make an adorable setting that welcomes friends and families into your home or gives someone driving by warm feelings of Christmas magic.